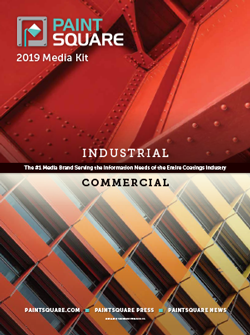 The Technology Publishing Co. product portfolio offers comprehensive coverage of the industrial and commercial coatings markets and consists of print magazines, digital platforms, business intelligence tools, events, and custom offerings. We are committed to serving readers across the entire value chain — suppliers, specifiers, facility owners, and contractors, for example — in each business segment. The TPC team creates the highest-quality content by, in part, recruiting top industry thinkers as advisers and contributors. LOOKING FOR THE 2018 MEDIA KIT? DOWNLOAD IT HERE. DOWNLOAD THE 2019 JPCL MEDIA KIT. In the protective and marine coatings industry, the Journal of Protective Coatings & Linings (JPCL) is unmatched for readership, value and reach. The monthly magazine has been a member benefit of the Society for Protective Coatings (SSPC) since 1984. The official magazine of SSPC, JPCL is a monthly technical journal dedicated to the world of high-performance coatings used in the protection and preservation of steel and concrete in industrial and marine structures. 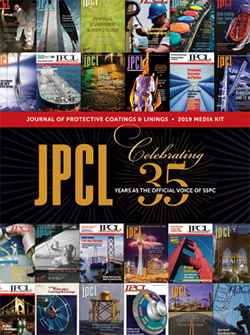 A JPCL magazine subscription is a premier benefit for every member of SSPC, The Society for Protective Coatings. PaintSquare.com is the definitive #1 website for the protective and marine coatings sector, providing up-to-date news, technical features, videos, resources, digital directories and the JPCL digital magazine archive. Paint Square Daily News is a vital information source for the protective and marine coatings industry, delivering all the important daily news and developments subscribers depend on to start their busy day. Paint BidTracker is the only project-lead service designed specifically for the coatings industry, providing industrial and commercial painting leads in real time. Contractors, consultants, suppliers, manufacturers and facility owners rely on the exclusive business intelligence provided by the Paint BidTracker data platform to support their sales and marketing objectives and business goals. The Paint BidTracker Captial Spending Wall Map Series provides a dynamic visualization of budgeted spending in 2017 by state, by number of projects and by project type. There are three individual maps produced annually: Bridges & Highways, Water Tanks, and Water & Wastewater. Contractor Connect is a two-day “Hosted Buyer” event, offering buyers and sellers a venue where they can develop business relationships in prescheduled one-on-one meetings and have the opportunity to network in a variety of social activities. To download this 2019 Media Kit, please complete this short form.